India's Finance Minister Arun Jaitley holds his briefcase as he arrives at the parliament to present the federal budget in New Delhi, India, Feb. 1, 2018. With an eye on general elections next year, India has announced several populist measures that include a health insurance program for 500 million people, and billions of dollars for rural development and affordable housing in its annual budget. Finance Minister Arun Jaitley said the measures aimed at improving “ease of living” for citizens, the vast majority of whom live in rural areas. 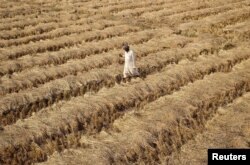 The announcements came amid widespread rural distress due to falling crop prices. Several farmers protests, sometimes violent, took place last year. 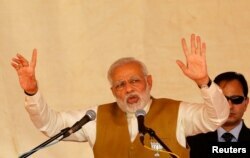 In a country where two thirds of the 1.3 billion people depend on agriculture, there are growing worries the anger in the countryside will pose a challenge for Prime Minister Narendra Modi’s Hindu nationalist government when it seeks reelection next year. FILE - India's Prime Minister Narendra Modi addresses his supporters during a campaign meeting ahead of Gujarat state assembly election in Kalol on the outskirts of Ahmedabad, India, Dec. 8, 2017. Saying "my government is committed to the welfare of the farmers," Finance Minister Arun Jaitley added the government would focus on building rural infrastructure such as roads and irrigation projects, as well as opening new agricultural markets to help farmers get better prices for their crops. Jaitley promised to sharply increase the price at which government buys food grains for its stocks and said that agricultural trade, which is restricted, will be liberalized to allow farmers direct access to markets. "We consider agriculture as an enterprise and want to help farmers to produce more from the same land parcel at lesser cost, and simultaneously realize higher prices for their produce," he said. Much attention was also focused on the health insurance plan unveiled by the government, which Jaitley called the “world’s largest.” It aims to give medical coverage of about $7,800 to 100 million poor families annually. FILE - A patient has his blood taken to be tested at a fever clinic especially set up to cater to those suffering from fever, one of the main symptoms of several mosquito-borne diseases such as dengue, at a hospital in New Delhi, India, Sept. 15, 2016. The measure is significant in a country where poor people are often forced to sell their assets, such as land and jewelry, to pay for healthcare. Government hospitals, which provide free medical facilities are inadequate and overcrowded, and private hospitals are usually unaffordable for lower income groups, who seldom have health insurance. The government also said it would build more health centers in rural areas. FILE - A farmer walks through a paddy field on the outskirts of Jammu, India, Nov. 19, 2016. But even as the government is making its massive outreach to rural areas, there are worries that it also faces growing disaffection because it has been unable to meet its pledge to create millions of jobs for India’s young population. It was a key plank that catapulted Modi to power in 2014.